The recipes provide examples of how you can use Blue Dot. Don’t be restricted by these ideas and be sure to have a look at the Blue Dot API as there is more to be discovered. The simplest way to use the Blue Dot is as a wireless button. 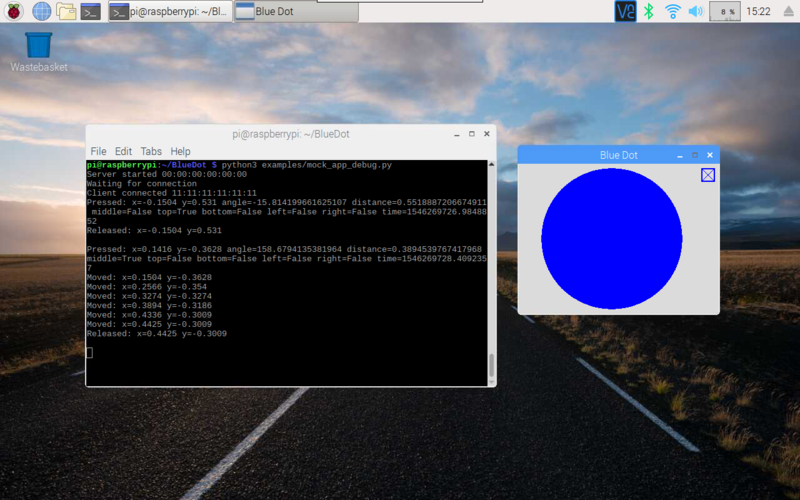 Using Blue Dot in combination with gpiozero you can interact with electronic components, such as LEDs, connected to your Raspberry Pi. The Blue Dot can also be used as a joystick when the middle, top, bottom, left or right areas of the dot are touched. These recipes assume your robot is constructed with a pair of H-bridges. The forward and backward pins for the H-bridge of the left wheel are 17 and 18 respectively, and the forward and backward pins for H-bridge of the right wheel are 22 and 23 respectively. You can change the robot to use variable speeds, so the further towards the edge you press the Blue Dot, the faster the robot will go. By holding down the Blue Dot and moving the position you can use it as an analogue slider. To make a vertical slider you could change the code above to use BlueDotPosition.y instead. You can interact with the Blue Dot by swiping across it, like you would to move between pages in a mobile app. You can use Blue Dot like a rotary encoder or “iPod classic click wheel” - rotating around the outer edge of the Blue Dot will cause it to “tick”. The Blue Dot is split into a number of virtual segments (the default is 8), when the position moves from one segment to another, it ticks. The dot doesn’t have to be blue or a dot, you can change how it looks, or make it completely invisible. A dictionary of available colors can be obtained from bluedot.COLORS. You can interact with the Bluetooth adapter using BlueDot. Blue Dot includes a MockBlueDot class to allow you to test and debug your program without having to use Bluetooth or a Blue Dot client. MockBlueDot inherits from BlueDot and is used in the same way, but you have the option of launching a mock app which you can click with a mouse or writing scripts to simulate the Blue Dot being used.